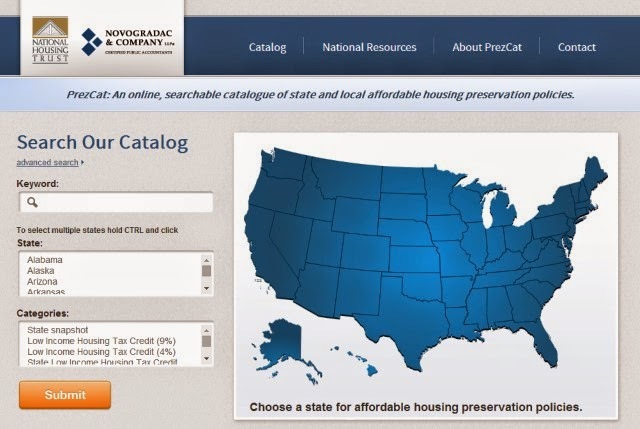 PrezCat is an online, searchable catalogue of state and local affordable housing preservation policies created in a joint effort shared by the National Housing Trust and Novogradac & Company LLP. Launched in early 2014, PrezCat allows affordable housing preservation developers, housing finance authorities, housing advocates, state and local decision makers and other stakeholders to easily search and query policies, data and programs that are most relevant to their short- and long-term needs. The new database lets you search by keywords to find all state policies on a topic, or you can search through an individual state’s policies on affordable housing preservation. In addition, you can search by categories like Low-Income Housing Tax Credit (9%) to find the resources for that topic. PrezCat also provides snapshot views by state and links to QAPs and applications as well as to national trends, policy and databases. For more information visit http://www.prezcat.org/.